Lotus 56B Turbine Vintage Indy Car by guaro3d is licensed under the Creative Commons - Attribution - Non-Commercial license. This is a scale model of the beautiful Lotus 56B Turbine Formula 1 racing car. 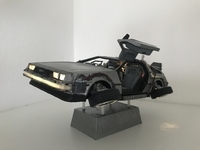 The model is in 1/24 scale and has been designed to be printed with a 0.4 nozzle and 0.15 layer height. 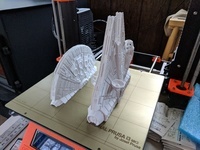 You could also scale it up or down to get other scales, if you are going for smaller scale i would recommend a 0.3 nozzle and 0.1 layer height to get the details of the model. For assembly you will need 2 rods of 2 mm diameter and 78 mm long for the wheel axles. The assembly process is very straightforward, attached is a picture for guidance. If you have the opportunity to print this model please publish your make.